The main chaos had subsided by 1971. After order was reasonably restored, Mao's propagandists tried to save Mao's skin by blaming the Cultural Revolution on the "Gang of Four." The Cultural Revolution didn't officially end until the Gang of Four was arrested in October 1976, which occurred shortly after Mao’s death. The ban on the playing of Beethoven music lasted until March, 1977. At the time of the Tangshan earthquake in 1976, the Chinese government was in the last stages of the Cultural Revolution, before Chairman Mao’s death, and was widely criticized for its insufficient mobilization immediately following the earthquake. October 6, 1976: Jiang Qing and the Gang of Four are arrested in a bloodless revolt led by military commanders working with Mao's successor, Hua Guofeng, effectively ending the Cultural Revolution. All four were eventually sentenced to prison and suffer primary blame for injustices and atrocities of the Cultural Revolution that might have otherwise been attributed to Mao. At her trial, Jiang declared that she was "Chairman Mao's dog. Whomever he asked me to bite, I bit." Lin Biao and Mao Without question, the turning point in the decade of the Cultural Revolution was Lin Biao's abortive coup attempt and his subsequent death in a plane crash as he fled China in September 1971. 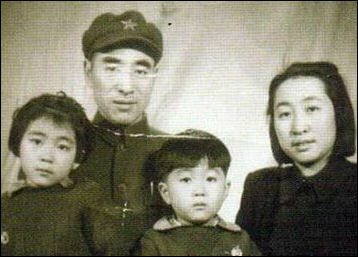 Lin Biao was a founding father of the People’s Republic later condemned as a counter-revolutionary. Sometimes referred to as the evil genius of China or the Chinese Trotsky, he accompanied Mao on the Long March and came up with idea of the Little Red Book and chose the quotations. As the minister of defense and head of the People's Liberation Army, he served Mao well as a brilliant military tactician, a suburb propagandist and skilled organizer of the masses. For many years he stood in the wings as Mao's handpicked successor. In April 1969, the Communist Party elevated Lin Biao as Mao's heir-apparent and "closest comrade in arms." 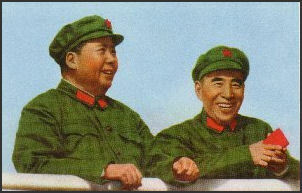 There was an internal power struggle between Mao and Lin Biao, because Lin’s power in the army as well as in the Party leadership had apparently become too strong in Mao’s view. In September 1971, Lin Biao reportedly hatched a plan to assassinate Mao and take over the Chinese government. Apparently he had grown tired of waiting for Mao to die and had become disillusioned with Mao's policies. When the plot was discovered Mao was ordered to go to the Great Hall of the People because it was easiest palace to protect him and Lin Biao hopped on a plane to flee the country. The Lin Biao incident was a heavy blow to Mao. All of Lin’s associates in the military and the Party were subsequently arrested. After the plane crashed Mao became depressed and stayed in bed for weeks. He became so weak and breathing was so difficult he could not even cough. Lin Biao has been airbrushed out of photographs at the Mao Museum. Anti-Gang of Four poster With Mao’s approval, Deng Xiaoping, PLA’s Chief of Staff at that time, ordered military troops to attack Shadian, a Muslim hamlet in Yunnan Province. A large armed force was used, which included a division from the 14th Corps, soldiers from Mengzi military sub-district, one artillery regiment, and thousands of local militias. The whole town was razed, and more than 1,600 unarmed civilians, including 300 children, the elderly and the sick attempting to flee, were killed. 1976; April 5: The gathering of millions of people at Beijing’s Tiananmen Square during the Qingming festival season in early April 1976 was at once an outpouring of grief over the death of Premier Zhou Enlai and a mass protest against the cultural revolutionaries within the CCP leadership---namely, Mao and his inner circle. With Mao’s approval, over ten thousand soldiers, policemen and militiamen were deployed at Tiananmen Square on April 4-5 to crack down on the uprising. Since this movement was taking place simultaneously in major cities across the nation, the severe crackdown was widespread all over China. A detailed German study cited Hong Kong estimates to the effect that “millions were drawn in nationwide,” and a Taiwan intelligence source claimed that “close to 10,000 lost their lives, nationwide.”. Formally redressed two years after the Cultural Revolution, the Tiananmen Incident, as part of a broader April Fifth Movement in urban China, not only pronounced the bankruptcy of the Cultural Revolution but also marked the first instance when ordinary citizens came together and challenged the regime. 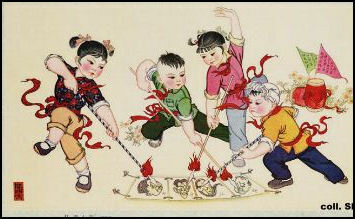 Mao died on September 9, 1976 at the age of 82. By that time he suffered from Lou Gehrig's disease and emphysema, and had three heart attacks in the previous four months. 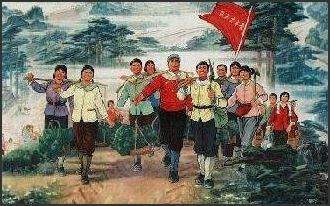 A team of 16 of China's best doctors and 24 first-rate nurses were at Mao's side when he died at 12:10am. See Separate article on Mao's Death and Legacy. 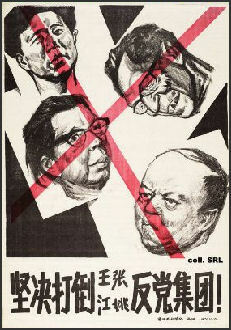 The Gang of Four was arrested in a bloodless coup one month after Mao's death in September 1976, marking the end of the Cultural Revolution. They were put on trial in 1980 and convicted of "persecuting to death" 34,000 people. Although the Gang of Flour clearly had a lot to answer for they were also made scapegoats. By blaming them a lot of officials were allowed to save their own skin. On October 6, 1976 and after: After nearly a month’s careful planning with Wang Dongxin (the head of security force for the Party Central) and Ye Jianying (Vice-Chairman of the Central Military Commission), Hua Guofeng, Vice-Chairman of the CCP staged a coup d’ état to arrest Mao’s closest cohorts, designated the “Gang of Four,” which included Mao’s wife Jiang Qing and three other CCP Politburo members, namely, Wang Hongwen, Zhang Chunqiao and Yao Wenyuan. The Cultural Revolution ended. However, mass killings did not end peacefully in China under Mao’s shadow. Upon concluding the Cultural Revolution, the New Party Central on February 22, 1977 issued an order to kill “any counterrevolutionaries who verbally attacked Chairman Mao and Chairman Hua (Guofeng).” In less than a year, 44 famous political dissidents were executed nationwide, including Wang Shengyou in Shanghai and Li Jiulian in Jiangxi Province, all of whom were formally rehabilitated later after their death. See Gang of Four in the first Cultural Revolution section. In January 1981 the court rendered guilty verdicts against the ten. Jiang Qing, despite her spirited self-vindication and defense of her late husband, received a death sentence with a two-year suspension; later, Jiang Qing's death sentence was commuted to life imprisonment. So enduring was Mao's legacy that Jiang Qing appeared to be protected by it from execution. The same sentence was given to Zhang Chunqiao, while Wang Hongwen was given life and Yao Wenyuan twenty years. 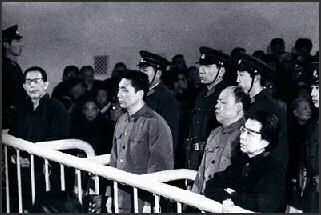 Chen Boda and the other Lin Biao faction members were given sentences of between sixteen and eighteen years. In China the Gang of Four became known as the ‘shanghai clique.” Jiang never repented. She committed suicide in prison. Yao Wenyuan was released from jail at the age of 71 in 1996 after serving a 20 year prison sentence. The last surviving member of the Gang of Four, he died in December 2005. Zhang Chunqiao, another member, died of cancer of April 2005. Wang died in 1992.